Niamey ([njamɛ]) is the capital and largest city of the West African country Niger. Niamey lies on the Niger River, primarily situated on the east bank. It is an administrative, cultural and economic centre. 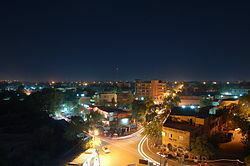 Niamey's population (presumably the settlement) was counted as 978,029 as of the (2012 census final adjustment), however, its administrative area the Niamey Capital District, covering 670 km2, had 1,026,848 people (2012 census final adjustment). As of 2017, recent population projections show the capital district growing at a rate less than the country as a whole, which has the world's highest fertility rate. The city is located in a pearl millet growing region, while manufacturing industries include bricks, ceramic goods, cement and weaving. Niamey was probably founded in the eighteenth century, but was of little importance to most of the country until the French developed a colonial post in the 1890s. This rapidly grew into an important centre. In 1926 it became the capital of Niger, and the population gradually increased, from about 3,000 in 1930 to around 30,000 in 1960. The period from 1970 to 1988 was one in which the economy of Niger boomed, driven by revenue from the uranium mines at Arlit. 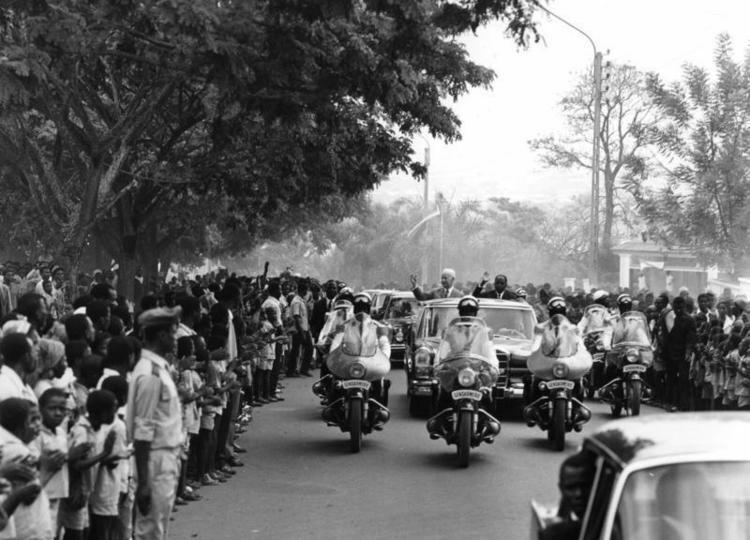 In this period, the population of Niamey grew from 108,000 to 398,365 inhabitants. The city expanded from 1,367 hectares (3,380 acres) in 1970 to 4,400 hectares (11,000 acres) by 1977, in the process annexing peripheral villages such as Lazaret. By some estimates the population had reached 800,000 in 2000. In 2011, government press estimated the total urban population at over 1.5 million. A major cause of the increase has been in migration for work and during droughts, as well a high population growth. This last factor means a majority of the city's citizens are youths. Covering an area of over 250 km2 (97 sq mi), the metropolitan area sits atop two plateaus reaching 218 m (715 ft) in altitude, bisected by the Niger River. At Niamey, the river, running almost straight SSE from Gao, makes a series of wide bends. The city was founded on the east ("left bank") of the river as it meanders from a west to east flow to run almost directly south. A series of marshy islands begin at Niamey and extend south in the river. The climate is hot semi-arid (Köppen climate classification BSh), with an expected rainfall of between 500 mm (20 in) and 750 mm (30 in) a year, mostly beginning with a few storms in May, then transitioning to a rainy season, usually lasting from sometime in June to early September, when the rains taper off rather quickly. Most of the rainfall is from late June to mid-August. There is practically no rain from mid-October to April. Niamey is remarkably hot throughout the year. In fact, it is one of the hottest major cities on the planet. Average monthly high temperatures reach 38 °C (100 °F) four months out of the year and in no month do average high temperatures fall below 32 °C (90 °F). During the dry season, particularly from November through February, nights are generally cool. Average nighttime lows between November and February range from 14–18 °C (57–64 °F). While Niamey's population has grown steadily since independence, the droughts of the early 1970s and 1980s, along with the economic crisis of the early 1980s, have propelled an exodus of rural inhabitants to Niger's largest city. Under the military government of General Seyni Kountché, there were strict controls on residency, and the government would regularly round up and "deport" those without permits back to their villages. The growing freedoms of the late 1980s and 1990s, along with the Tuareg Rebellion of 1990s and famine in the 2000s, have reinforced the process of immigration, with large informal settlements appearing on the outskirts of the cities. Noticeable in the city's centre since the 1980s are groups of poor, young, or handicapped beggars. Within the richer or more trafficked neighbourhoods, these beggars have in fact formed a well-regulated hierarchical system in which beggars garner sadaka according to cultural and religious norms. Attractions in the city include the Niger National Museum, incorporating a zoo, a museum of vernacular architecture, a craft centre, and exhibits including dinosaur skeletons and the Tree of Ténéré. There are also American, French and Nigerien cultural centres, seven major market centres including the large Niamey Grand Market, a traditional wrestling arena and a horse track. The city is also the site of Diori Hamani International Airport, the National School of Administration, Abdou Moumouni University, the Higher Institute of Mining, Industry and Geology which lies on the right bank of the river, and many institutes (Centre numérique de Niamey, IRD, ICRISAT, Hydrologic Institute, etc.) AMU has seen a number of protest actions over the years, including the 2006 Abdou Moumouni University protests. Several hospitals are located in Niamey, including the CURE Hôpital des Enfants au Niger, National Hospital and Lamordé University Hospital. In December 2005, it was the host of the Jeux de la Francophonie. Niamey makes up a special capital district of Niger, which is surrounded by the department of Tillabéri. Niamey hosts the African Centre of Meteorological Application for Development. More than 90% of Niger is populated by Muslims. Niamey hosts the largest mosque in the country, the Grand Mosque of Niamey. Within Christianity, the city is the headquarters of the Roman Catholic Archdiocese of Niamey. There is also a small Bahá'í community in Niamey. The city of Niamey itself is governed as an autonomous first-level administrative block, the Niamey Urban Community (fr. Communauté Urbaine de Niamey, CUN). It includes five Urban Communes, divided into 44 "Districts" and 99 "Quartiers", including formerly independent towns. It is a co-equal first division subdivision with the seven Regions of Niger. The Niamey Urban Community includes an administration and Governor appointed by national leaders. Like the rest of Niger, Niamey has seen a decentralisation of governance since 2000. Government Ordinance n°2010–56 and Presidential Decree n°2010-679 of September 2010 mandated an elected City Council for the city of Niamey, subsumed under the CUN. This excludes some outlying areas of the CUN. Forty-five councillors are popularly elected and in turn elect the Mayor of the City of Niamey. 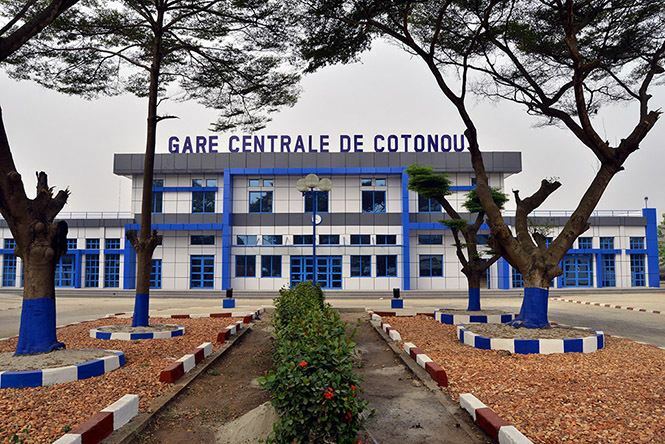 In July 2011 the first Mayor under the new system, Oumarou Dogari Moumouni, was installed by the Governor of the CUN Mrs. Aïchatou Boulama Kané and the City Council. The City Council and Mayor have limited roles compared to the CUN Governor. Niamey has a third layer of government in the Commune system. Each Commune elects its own council, and outside major cities, these function like independent cities. Niamey and other major cities have been, since the advent of decentralisation, developing co-ordination of Commune governments in large cities made up of multiple Communes. Under this devolution process formalised in the 1999 Constitution of Niger, the CUN contains five "Urban Communes" and no "Rural Communes". As all Nigerien Urban Communes, they are divided into Quarters ("Quartiers") with elected boards. The CUN includes land where there were formerly several surrounding towns and villages which the city of Niamey has now annexed. These include Soudouré, Lamordé, Gamkallé, Yantala, and Gaweye. The CUN covers a territory of 239.30 km2 (92.39 sq mi), or 0.02% of the nation's territory. 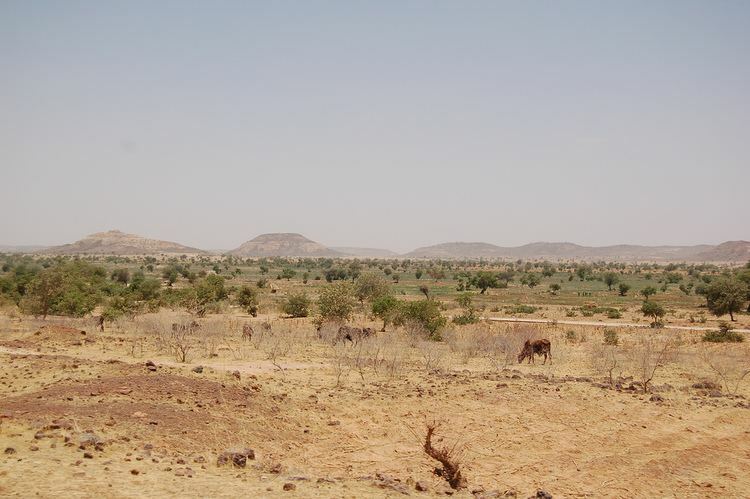 Until 1998, all of greater Niamey was part of Tillabery Region, which prior to 1992 was named the Niamey Department. The CUN remains surrounded on all sides by Tillabery Region. Niamey is served by the Diori Hamani International Airport, located 12 km south-east of the city and is crossed by the RN1 highway. Niamey railway station, officially inaugurated in April 2014, is the first one built in Niger.